Our vases have been full of tulips this month. My favourites for picking were Sarah Raven’s brandy snap mix. Their colours seem to suit the garden and the house. Steve prefers tulips in bright reds and yellows – I like them too – but these softer colours are more harmonious and gentler on the eye. I’m especially smitten with a variety called belle epoque. It reminds me of the coral charm peony we have by the back door. I find it difficult to pick peonies since their flowers are so fleeting, but it feels far more acceptable to cut a few tulips. 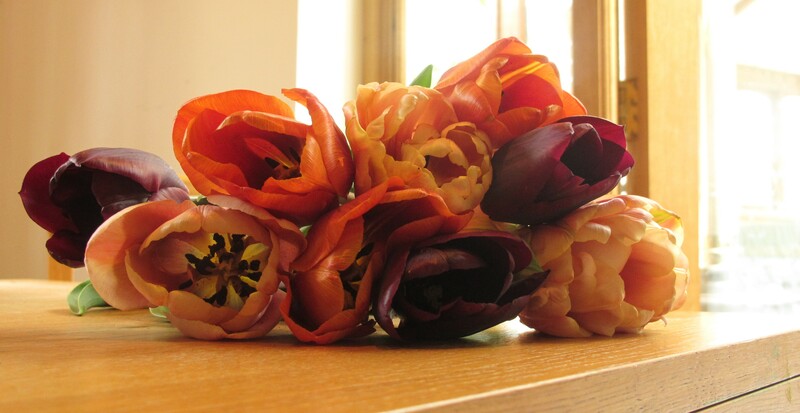 These lasted a good week in the vase, and smelt wonderful – almost summery. In fact, some of them looked a little nondescript in the garden, but came alive on a windowsill when they caught the sun. Its hard to believe these flowers came from the dry bulbs I planted on a bitter day in November. 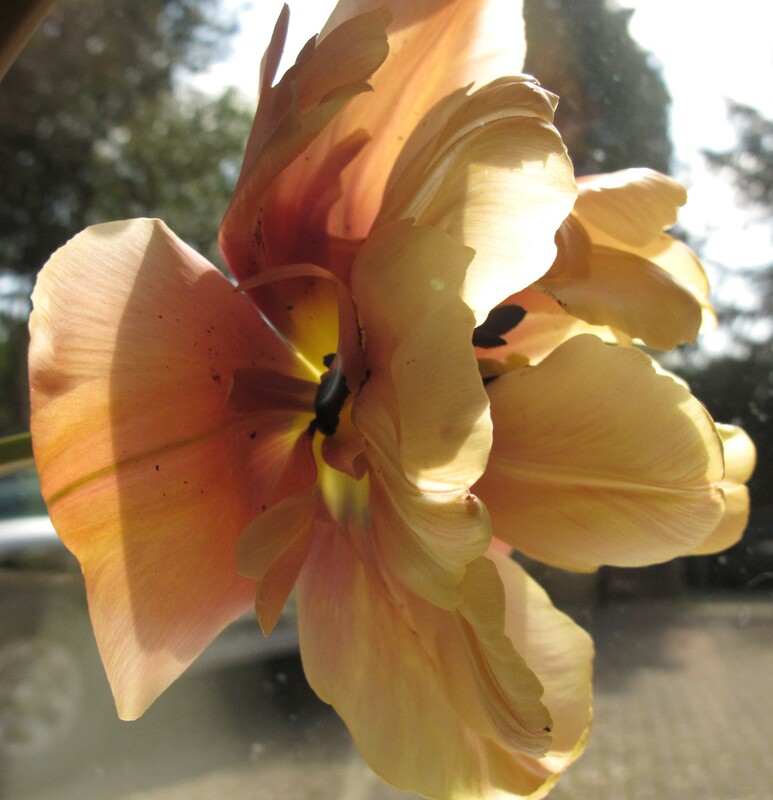 This entry was posted in outside-in: flowers for the house and tagged belle epoque, brandy snap mix, cairo tulip, cottage garden, gardening blog, Sarah Raven, tulip, tulipa. Bookmark the permalink. What a lovely mix of colours! Does Sara Raven say the individual names in a mix? It would be useful, these colours would suit my sitting room. Hi Christina – yes she does. This mix has belle époque, Cairo, ronaldo and Bruine wimple – hope you can get them in Italy! Actually I buy my bulbs from a UK company Peter Nyssen. They are great with much lower prices than Sara Raven and excellent quality, plus they deliver to Italy. Thanks Christina – I’m going to look them up! That’s a beautiful colour combination, I saw the collection in the catalogue and was tempted. Cairo, in particular, looks rather beautiful. Thanks Janet. I wish I’d bought more of them – they had 50% off in the end of season sale. They did look better in the house than in the garden, would have been better if I’d planted them closer together. 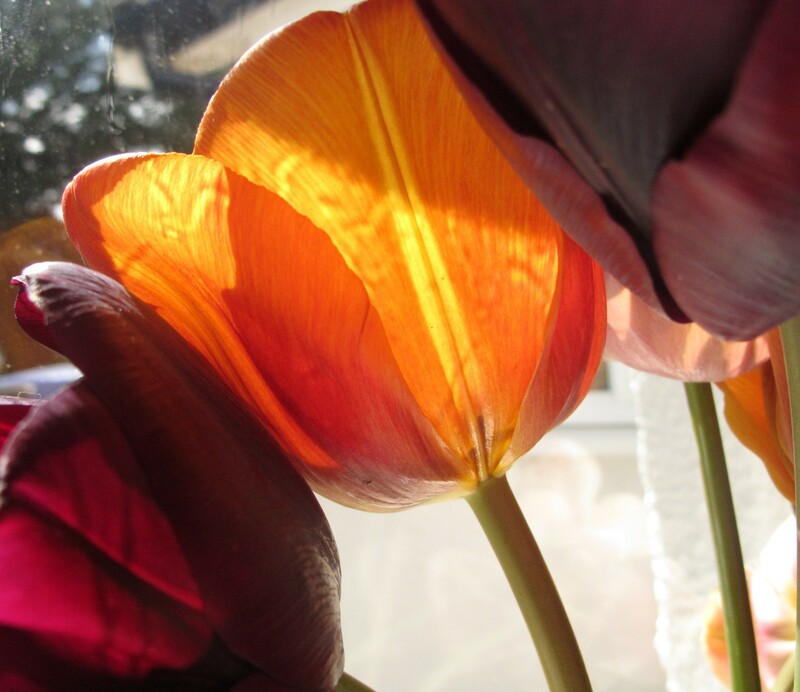 I think tulips are probably my favourite flowers, just the array of colours they bloom in amazes me! lovely colours, aren’t tulips beautiful? They are gorgeous. What a lovely thing to remember for next winter…to plant the bulbs and know that this will come in Spring and bring such joy! I love tulips.